Papaver is one of those ladies who heralds the arrival of summer's full swing. Some families have sacred herbs; tutelary spirits who appeared in the superstitions or lore or stories over time. 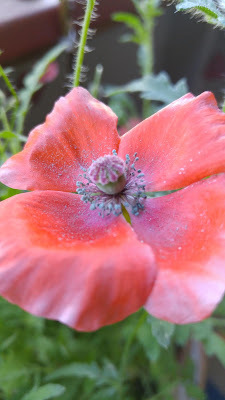 My immediate family is mad for poppies; opium, oriental or California- they're all deeply symbolic for us. There's generational poppies, planted by my grandma and sister in my mom's yard. Though I've long left home, I go back and check every summer. I harvest the heads and seeds and stems, every year I grow a batch of my own from one source or another. 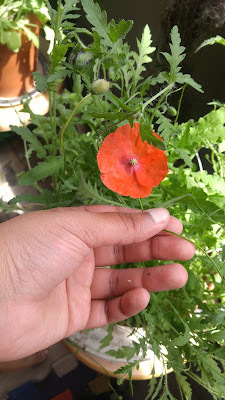 In my home the poppy resonates with sun, fire and water, sleep, capnomancy, dreams, solitude and love. Papaver isn't much like most of her other sisters; she's deeply asocial (like me), prefers to smoke and sleep the day away (like me) and is well aware of her charm. She adores to be everywhere and beautiful, to be loved and fawned over- but she'll take you away from everything you love if you let her. She pretends to be submissive but in truth, she can be a tyrant. Yes those are real poppies on her-not just that, but they were painted with a mixture of acrylic and poppy latex. 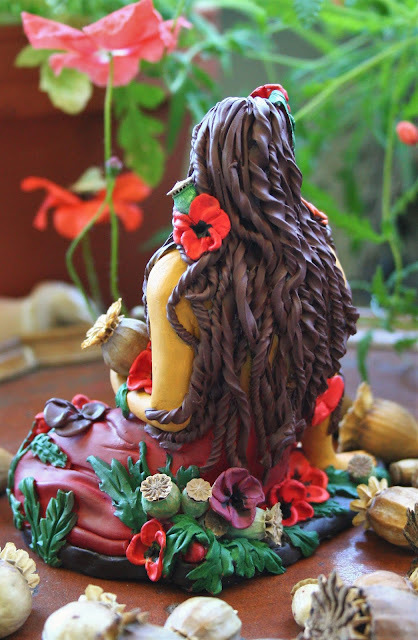 I wanted to make sure the poppy spirit was immersed throughout her. She also has a pod full of seeds where her heart should be. 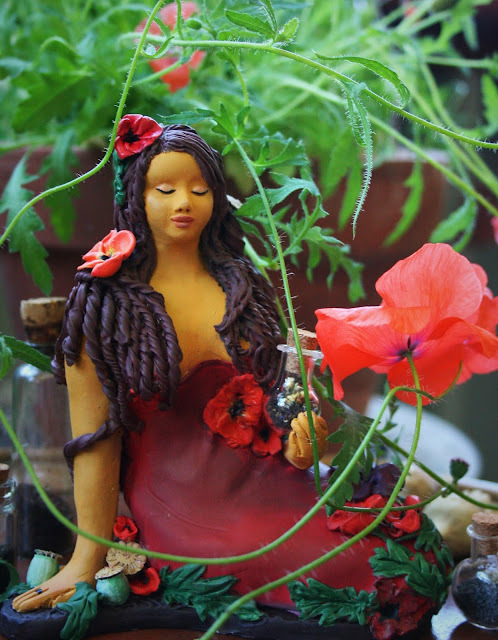 I prefer her pure form, as the plant goddess she is; beautiful, big, bouncing flowers bobbing on their long stems in the summer wind, those lush green leaves, those beautiful and magical pods that hold an eternity of seeds and secrets. It's the seeds and pods I like the most; the seeds are part of nearly all smoke blends I use for capnomancy and the pods have about a dozen uses from dream charms to spirit housing. Poppy is one of my very favorite witches; we grew up together, ate together, drank and dreamed together. 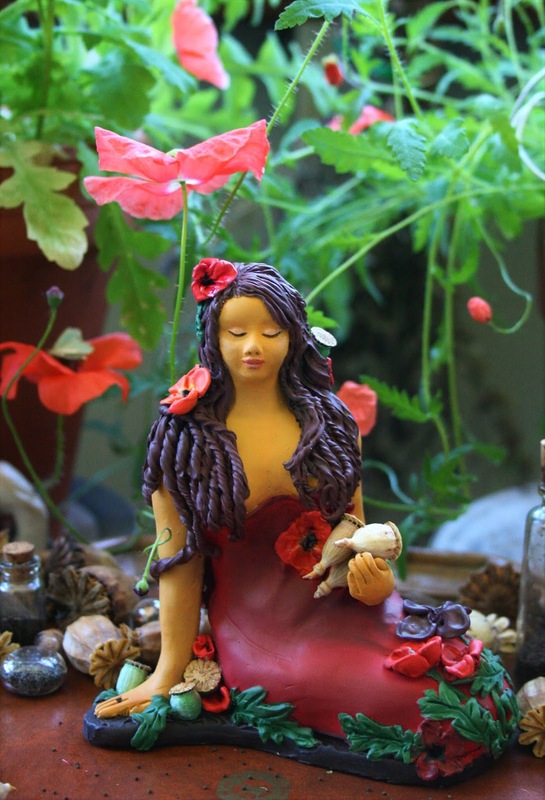 So many of the traditional herbs of the Witch's Ointment are completely inaccessible and foreign to me, but poppy is the first witch in Hekate's garden I see in my crossing, the last I see at the gates, and the field that lies between me and the otherside. "Poppies have been grown for beauty, magic and medicine for centuries,. Egyptians felt hat poppies were a necessary part of funerals and burial rituals and were essential for assuring life after death. Dried poppy petals have been found in tombs dating back 3000 years. 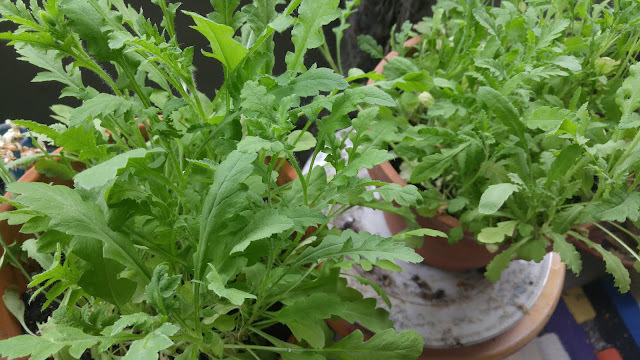 Early Romans used juice from the poppy plant for witchcraft. It was thought to be particularly effective in easing the pains of love."